After 53.Rc4+ (White has nothing better), Black had an opportunity to create a nice example of the Steel King - a winnende wandelkoning in Dutch - against his much stronger opponent. He was going to lose his Queen, but with 53...Ke3 54.Rxb4 Kxf3 he could have won White's King. As it was however, he acquired a different sort of immortality, that of the ultimate blunder - he resigned. Thanks to Aad de Bruijn for showing me this. In L'Ami - Timman, in Wednesday's 5th round in the Amsterdam tournament, an interesting tactical moment arose. White is a pawn up, and he could have safely played for a win, why not with 35.Rxd7, but when he took a different pawn with 35.Qxh5, this allowed the tactical shot 35...d5 A horizontal pin of the Pe5; exd6 is met by Ne3+ winning the Queen. For this strange property of the en passant capture, see items 234 and 236 in this Diary. After 36.Nd2 Qc2 37.Qe2 c5 38.Kf2 Nd4 39.Qe3 Nf5 40.Qe2 Nd4 41.Qe3 Nf5, the players agreed to a draw. Looking at this fragment with a computer however, I discovered that White could very well have played 36.exd6, retaining good winning chances: 36.exd6 Ne3+ 37.Nxe3 Qxh5 38.dxc7 Rf8 39.Rd8 Qc5 40.c8Q Qxc8 41.Rxc8 Rxc8 42.Nc4 etc. In other variations too, White will have Knight + 3 Pawns vs. Rook. Straight from the Olympiad in Turin, Loek van Wely drove to Meyrueis in the Lozère (South East France) to participate in the Tour de Tim Krabbé. He did well there, finishing with a strong 21 minutes and 50 seconds in the Col d'Uglas time trial. Any chess player (or cyclist) who wants to beat him should go to the D50 between Anduze and St. Jean-du-Gard (Gard), start his stopwatch where the D160 branches off to the right, and stop it on top of the col. Or join next year's Tour. The Netherlands are doing well in Turin, but in today's 7th round top match Netherlands - Armenia, Ivan Sokolov was crushed in a brilliant miniature by Levon Aronian on first board. Or was it a bad game by Sokolov? In any case, grandmasters of his calibre don't often lose like this, with White, and within 20 moves. 17...Qc6 And there's nothing against the back rank mate. 18.Qe5+ Kd8 19.Qxh8+ Kd7 and White resigned. PS 30 May: Aronian used 1 minute for his moves. Or so I'm told by Bertrand Delafargue, who read it on the chess blog of Christophe Bouton, who heard it from the Moroccan player Jacques Elbilia who witnessed the game. PS 5 August: Quoting New in Chess, 2006-5: "On the Internet the rumour circulated that Aronian had only spent one minute on the entire game. Indeed, his clock indicated 1:29 at the end of the game, but given the 30-second increment [...] this meant that in all he had used up 10.5 minutes. Still not bad." Incredible news from the wizards of 7-men endgames, Marc Bourzutschky and Yakov Konoval. Barely two months after breaking the 300-move barrier in tablebase endgames (see item 311) they have now found a position where it takes White 517 moves to win (convert to a winning sub-endgame) with best play by both sides: White and Black always aim for the fastest and slowest conversions, respectively. At the discussion forum TalkChess Bourzutschky writes: "This was a big surprise for us and is a great tribute to the complexity of chess." Here are those moves. As always, only-winning moves have an exclamation mark. NB: Games over 300 moves cannot be entered in ChessBase, but the moves can be played over on the Palview board on the left. And as Bourzutschky notes, Scid also manages without a hitch. You can copy & paste the moves into it; it's not even necessary to remove the ! 's - they show up, too. 1...Rd7+ 2.Kc3! Bd1 3.Qf1+! Bf3 4.Qc1+! Kf5 5.Kb2! Rb7+ 6.Ka3 Ra7+ 7.Kb4 Rb7+ 8.Ka5 Ra7+ 9.Kb6 Rb7+ 10.Ka6 Re7 11.Qf1 Re6+ 12.Ka7 Re7+ 13.Kb8 Re8+ 14.Kc7 Re3 15.Kc8 Rc3+ 16.Kb8! Kf4 17.Qg1! Ne4 18.Nf1! Rb3+ 19.Ka7! Rd3 20.Qh2+! Kf5 21.Kb8 Nf6 22.Nd2! Bd5 23.Qf2+! Ke5 24.Qe2+ Kd4 25.Ka7 Nd7 26.Qg4+! Kc5 27.Qg1+! Kb4 28.Qb1+! Kc3 29.Qc1+ Kd4 30.Qb2+ Kc5 31.Qc2+! Kd4 32.Qa4+ Kc5 33.Qa5+ Kd4 34.Qb4+ Ke5 35.Ka6 Kf5 36.Qb1 Ne5 37.Kb5! Bc6+ 38.Kb4! Bd5 39.Qf1+ Kg6 40.Qe2 Kf6 41.Qh5 Ke6 42.Qg5 Nc6+ 43.Kb5 Ne5 44.Qh6+ Kf5 45.Nf1 Bc6+ 46.Kb4 Rd4+ 47.Kb3 Rd3+ 48.Ka2 Bd5+ 49.Kb1! Nc4 50.Qh5+! Kf6 51.Qh4+ Ke6 52.Ng3! Rb3+ 53.Kc1! Rc3+ 54.Kd1 Re3 55.Nf1! Ra3 56.Qf4 Kd7 57.Ke1 Kc6 58.Qh6+ Kc5 59.Kf2 Rb3 60.Qh8 Ra3 61.Qb8 Kc6 62.Qb1 Rc3 63.Kg1 Ra3 64.Qc2 Kb6 65.Qf5 Kc5 66.Qf8+ Kb5 67.Qe8+ Kc5 68.Qe2 Rf3 69.Qe7+ Kd4 70.Qg7+ Kc5 71.Qg5 Kc6 72.Qh4 Kb5 73.Qe7 Kb6 74.Qb4+ Kc6 75.Qe1 Ra3 76.Qf2 Rf3 77.Qd4 Kd6 78.Qh4 Kc5 79.Nh2 Ra3 80.Ng4 Ra1+ 81.Kf2! Ra2+ 82.Kg3! Ra3+ 83.Kf4 Rf3+ 84.Kg5 Be6 85.Nf6! Ne5 86.Nh5 Rf5+ 87.Kh6 Ng4+ 88.Kg6! Ne5+ 89.Kh7 Rf7+ 90.Kh6! Ng4+ 91.Kg5 Ne5 92.Qa4 Rf5+ 93.Kh6! Bc4 94.Qa5+ Kd4 95.Qb6+ Kd5 96.Qd8+ Ke4 97.Qd1 Ke3 98.Qc1+ Kd4 99.Ng3 Rf6+ 100.Kh5 Kd5 101.Kh4 Rg6 102.Kh3 Bd3 103.Qf4 Rg8 104.Qb4 Bc4 105.Qd2+ Ke6 106.Qh6+ Kd5 107.Qh7 Kc5 108.Kh2 Rg6 109.Qe7+ Kd5 110.Qd8+ Ke6 111.Qf8 Kd5 112.Kh3 Bb5 113.Qa3 Bc6 114.Kg2 Rf6 115.Kh2 Nf3+ 116.Kh3 Rh6+ 117.Kg2! Nd4 118.Qe7 Kc4+ 119.Kg1! Rg6 120.Qf7+ Re6 121.Qf4 Kd3 122.Qf1+ Kc3 123.Qc1+ Kb4 124.Kh2 Rf6 125.Kh3 Bd7+ 126.Kg2! Bc6+ 127.Kh2 Rf3 128.Qd1 Kc5 129.Nh5 Kd5 130.Qh1 Ke6 131.Qg1 Ke5 132.Qg7+ Ke4 133.Qc7 Kd5 134.Nf4+ Kc4 135.Qb8 Rc3 136.Qa7 Be4 137.Qb6 Bc6 138.Qa6+ Kc5 139.Nd3+ Kd6 140.Nb2 Rb3 141.Nd1 Nf3+ 142.Kg3 Nd4+ 143.Kf2 Rf3+ 144.Ke1 Kd5 145.Qb6 Kc4 146.Qa7 Bb5 147.Nf2 Nc2+ 148.Kf1 Bc6 149.Qa6+ Kc5 150.Qa2 Nd4 151.Kg1! Rf5 152.Kh2 Rh5+ 153.Kg3! Rg5+ 154.Kf4! Rf5+ 155.Kg4 Bf3+ 156.Kh4 Rh5+ 157.Kg3 Rg5+ 158.Kf4 Rf5+ 159.Ke3! Re5+ 160.Kd3 Be2+ 161.Kd2! Kb4 162.Qg8 Bb5 163.Qg4 Re2+ 164.Kc1! Kc4 165.Nd1! Rc2+ 166.Kb1 Rd2 167.Qc8+ Bc6 168.Qg8+! Kb4 169.Nb2 Be4+ 170.Ka2! Nb5 171.Qb3+! Ka5 172.Ka1! Bd5 173.Qa4+! Kb6 174.Qb4! Rd4 175.Qe1 Be4 176.Nd1 Rc4 177.Qe3+ Kc6 178.Kb2 Rc2+ 179.Kb3 Nd6 180.Qh6 Rc5 181.Nc3 Bd5+ 182.Kc2 Kd7 183.Qg7+ Kc6 184.Kd1 Bf7 185.Kd2 Bc4 186.Ke1 Ra5 187.Qf6 Rf5 188.Qg6 Kc7 189.Qg7+ Rf7 190.Qg3 Kc6 191.Qg2+ Kc7 192.Qh2 Kc6 193.Qh1+ Kc5 194.Qh8 Re7+ 195.Kd1! Re8 196.Qh2 Re3 197.Kc2 Rd3 198.Qe5+ Kc6 199.Qh5 Rg3 200.Qa5 Rh3 201.Kd2 Rh2+ 202.Ke3 Rh3+ 203.Kf4 Rd3 204.Na4 Rd4+ 205.Kf3 Rd3+ 206.Kg4 Rd4+ 207.Kh3 Ne4 208.Qa7 Be6+ 209.Kg2! Rb4 210.Qa6+! Kd5 211.Kf3 Kd4 212.Qe2 Kd5 213.Ke3 Bd7 214.Nb2 Bb5 215.Qh5+ Ke6 216.Nd1 Nf6 217.Qh3+ Kf7 218.Kd2 Rd4+ 219.Kc1 Rc4+ 220.Kb2 Rb4+ 221.Ka3 Ra4+ 222.Kb3 Rd4 223.Nc3 Bc4+ 224.Kc2! Be6 225.Qe3 Rh4 226.Qa7+ Kg6 227.Ne2 Rb4 228.Kc1 Rc4+ 229.Kb2 Rb4+ 230.Ka3 Rb3+ 231.Ka4! Rf3 232.Qd4 Bd7+ 233.Kb4 Be6 234.Qc5 Bd7 235.Qd6 Bg4 236.Nd4 Rd3 237.Kc4 Re3 238.Nc6 Bc8 239.Qh2 Re4+ 240.Kc5 Bb7 241.Qg1+ Kh7 242.Na7 Rg4 243.Qh2+ Kg6 244.Nb5 Rg2 245.Qh3 Rg5+ 246.Kb4 Bg2 247.Qh2 Bd5 248.Nd6 Ne4 249.Nc8 Nf6 250.Qd6 Rh5 251.Qc7 Kg5 252.Qe5+ Kg6 253.Qe3 Kh7 254.Qd3+ Kg7 255.Nd6 Rg5 256.Ka4 Rh5 257.Qg3+ Kh7 258.Kb4 Kh6 259.Ka3 Rg5 260.Qc3 Kg6 261.Qc2+ Kh6 262.Nf5+ Kh5 263.Qd3 Kg6 264.Ng3+ Kf7 265.Qe3 Rg8 266.Nf5 Ra8+ 267.Kb2! Ra2+ 268.Kb1 Ra6 269.Qe7+ Kg6 270.Nd6 Rb6+ 271.Kc2 Rb3 272.Qe5 Rf3 273.Kd2 Bc6 274.Nc4 Bd5 275.Ne3 Be4 276.Ng4 Bb7 277.Qe6 Kg5 278.Ne5 Rf2+ 279.Kc3 Rf4 280.Nf7+ Kg6 281.Nd6 Be4 282.Kd2 Rf2+ 283.Ke1 Rf4 284.Qc4 Kg5 285.Qe2 Bg6 286.Qe5+ Kg4 287.Ke2 Bf5 288.Qa1 Nh5 289.Ke3 Bc2 290.Qa8 Bg6 291.Qd5 Ng3 292.Nc4 Nf5+ 293.Ke2! Ng3+ 294.Kd2 Kh3 295.Qc6 Re4 296.Qa6 Re2+ 297.Kc3 Be4 298.Qd6 Kg2 299.Kb4 Bf3 300.Ka5 Nf5 301.Qc5 Be4 302.Kb6 Rc2 303.Qb4 Kf2 304.Ne5 Ke3 305.Nd7 Nd4 306.Qa3+ Ke2 307.Ne5 Nf5 308.Qa6+ Kf2 309.Qa4 Ng3 310.Qb4 Ke3 311.Nc4+ Kd3 312.Nd6 Ke3 313.Ka7 Bd3 314.Qb6+ Kf3 315.Qd4 Be4 316.Kb8 Re2 317.Nf7 Bf5 318.Ng5+ Kg2 319.Qd5+ Be4 320.Qb3 Bf5 321.Qf3+ Kh2 322.Qb7 Re8+ 323.Ka7! Re2 324.Qd5 Rf2 325.Nf3+ Kg2 326.Nd2+ Kh3 327.Qc6 Kg4 328.Qc3 Rf4 329.Nc4 Re4 330.Ne3+ Kg5 331.Qc5 Re6 332.Kb8 Re8+ 333.Kb7 Re6 334.Kc7 Re4 335.Kc6 Re8 336.Kb6 Re4 337.Ka5 Re6 338.Kb5 Re4 339.Nd5 Nh5 340.Ne7 Ng3 341.Qc1+ Kh4 342.Qh6+ Kg4 343.Nd5 Kf3 344.Qf6 Kg4 345.Qg7+ Kf3 346.Qc3+ Kf2 347.Qc5+ Kf3 348.Ka5 Bg4 349.Nf6 Rf4 350.Qc6+ Kf2 351.Nd5 Re4 352.Qf6+ Bf3 353.Nf4 Ne2 354.Nd3+ Ke3 355.Ne5 Rf4 356.Qb6+ Nd4 357.Kb4 Ke4 358.Nc4 Kf5 359.Qh6 Be2 360.Ne3+ Ke5 361.Qh8+ Ke4 362.Qe8+! Kf3 363.Nd5! Re4 364.Qf7+ Kg3 365.Qg6+ Kf3 366.Nf6 Rf4 367.Qh5+ Kg3 368.Qg5+ Kf3 369.Kc3 Nb5+ 370.Kb3! Rc4 371.Nd5 Nd4+ 372.Kb2 Rc2+ 373.Kb1 Ke4 374.Nf6+ Kd3 375.Nd7 Bf3 376.Ne5+ Ke2 377.Qh4 Rd2 378.Nc4! Rd1+ 379.Kb2! Rd3 380.Qg5 Rb3+ 381.Ka2! Rd3 382.Qe5+ Kf2 383.Nb2 Rd2 384.Qf4 Ke2 385.Kb1 Bg2 386.Nc4 Rd3 387.Qh2 Kf1 388.Qh7 Rc3 389.Kb2 Rc2+ 390.Ka3 Rc3+ 391.Kb4 Ne2 392.Ne5 Rh3 393.Qf5+ Ke1 394.Nd3+ Kd2 395.Nc5 Rg3 396.Qh7 Ke3 397.Qd3+ Kf2 398.Qc4 Rc3 399.Qh4+ Rg3 400.Ka5 Kg1 401.Qe7 Kf2 402.Qf6+ Ke1 403.Qh4 Kf1 404.Qd8 Ke1 405.Nd3+ Kd2 406.Nb4+ Kc1 407.Qe7 Kd2 408.Qd6+ Ke3 409.Nc2+ Kf2 410.Qe7 Rf3 411.Qh4+ Rg3 412.Ka6 Bh3 413.Qf6+ Rf3 414.Qa1 Rd3 415.Qe1+ Kf3 416.Qb4 Kg3 417.Qe7 Kf2 418.Ka5 Rc3 419.Qf8+ Rf3 420.Qb4 Rc3 421.Qb6+ Kg3 422.Ne3 Nf4 423.Nc4 Rf3 424.Qc7 Rf2 425.Qg7+ Kh2 426.Qe5 Kg3 427.Qg5+ Kh2 428.Kb6 Bg2 429.Ne3 Bh3 430.Qe5 Kg3 431.Nd5 Kg4 432.Qd4 Kg3 433.Qe3+ Rf3 434.Qe5 Kg4 435.Nf6+ Kg3 436.Ne4+ Kg2 437.Qc5 Ne2 438.Qc4 Nf4 439.Qc2+ Kh1 440.Qc5 Bg2 441.Nf2+ Kh2 442.Ng4+ Kh3 443.Qg5 Rb3+ 444.Ka5 Ra3+ 445.Kb4 Rf3 446.Ne5 Nd5+ 447.Kb5 Rf4 448.Kc5 Be4 449.Nc6 Rh4 450.Qd2 Kg4 451.Qe1 Bg2 452.Qe6+ Kg3 453.Nd4 Nf4 454.Qb3+ Kh2 455.Qe3 Rh5+ 456.Kd6! Rd5+ 457.Ke7! Nh3 458.Qd2 Kg3 459.Qc3+ Kh2 460.Qe3 Rg5 461.Qe2 Nf4 462.Qf2 Rg4 463.Nf5 Nd5+ 464.Ke6 Rg6+ 465.Kd7 Rg4 466.Qe1 Nf6+ 467.Kc7 Ne4 468.Qc1 Rg5 469.Qf4+! Kg1 470.Ne3 Rg7+ 471.Kb6 Rg6+ 472.Ka5 Rg5+ 473.Kb4 Rg6 474.Qe5 Bf3 475.Qa1+ Kh2 476.Qb2+ Kh1 477.Qc1+ Rg1 478.Qc8 Rg3 479.Qh8+ Kg1 480.Qa1+ Kf2 481.Qd4 Rg5 482.Nf5+ Kg2 483.Qb2+ Kh3 484.Ne3 Rh5 485.Nf1 Kg4 486.Qg7+ Kh3 487.Qg1 Rh4 488.Ka3 Rf4 489.Qh2+ Kg4 490.Ne3+ Kg5 491.Nd5 Rf7 492.Qe5+ Kh4 493.Ne7 Ng5 494.Ng8 Ne4 495.Nh6 Rf6 496.Nf5+ Kg4 497.Ne3+ Kh4 498.Kb4 Rb6+ 499.Ka5 Rf6 500.Qh2+ Kg5 501.Qh7 Ng3 502.Qg7+ Rg6 503.Qe5+ Kh6 504.Qf4+ Rg5+ 505.Kb6 Be2 506.Qf8+ Kh7 507.Nd5 Bc4 508.Nf6+ Kg6 509.Nd7 Nh5 510.Qd6+ Kh7 511.Qe7+ Kh6 512.Qe3 Be6 513.Ne5 Bd5 514.Qd4 Bg8 515.Qd2 Nf6 516.Nf3 Nd5+ 517.Kb7 Kg7 518.Qxg5+ and White wins. "Even deeper 7-man endings may exist, but I doubt it," writes Bourzutschky. But also: "That such a great depth is still possible with so much firepower on the board suggests that even deeper endings may arise with 8 pieces, perhaps in krnnkbbn. This ending could be generated with 64 GB of RAM in a few months on a fast single CPU machine and about 5 terabytes of storage. Any takers?" A persistent myth on the internet has it that Louis Paulsen once played a game in which he captured en passant four times. Such a game does not exist - the greatest number of en passant captures by one player in one game, is two. There are only nine games with a total of three en passant captures, and only five with two consecutive en passant captures by one player. Only one game combines these two rarities. 30...f5 31.exf6! Based on 31...g5 32.hxg6! A winning queen's sacrifice. 32...Rxh7 33.gxh7 Black is powerless against the passed pawns. 33...e5 34.Rxe5 Qf7 35.Re7 Qf8 36.f7 Even stronger was 36.Be5 Nd7 37.Rxd7 Rxd7 38.f7 Rxf7 39.Rxf7 Qxf7 40.h8Q+ 36...Qxe7 37.f8Q Rxf8 38.Rxf8+ Qxf8 39.h8Q Qxh8 40.Bxh8 h5 41.Kc1 Kd7 42.Kd2 Ke6 43.Ke3 Kf5 44.f3 Nd7 45.Kd3 Nb6 46.Bg7 a5 47.Bf8 Nd7 48.Bd6 Ke6 49.Bc7 Kd5 50.c4+ bxc3 The third en passant capture. 51.Kxc3 and Black resigned. A reader, Pieter Roggeveen, now draws my attention to a game from the first round of the Bosna tournament, played yesterday, in which a new record in this field was achieved. 30.c4 dxc3 31.Bxc3 Ke8 32.Bd4 c5 33.dxc6 Bxc6 34.Kf2 f5 35.g4 hxg3+ with three en passant captures in 11 half-moves - the fastest such sequence. 36.Kxg3 Ba5 37.Kh4 Bd8+ 38.Kg3 Ba5 39.Kh4 Bd8+ and a draw was agreed. Chess Today, which celebrates its 2000th issue today, has a heartwarming predilection for the bizarre. Besides all the news, tactical positions, discussions, they bring a seriously and deeply analyzed game every day; often something unusual like today's avalanche - see below. Some time ago, analyst Maxim Notkin chose the following game partly for its final position. Seven nil - Black resigned. Eight nil. After 38...Ne2 39.Qe7+ Black resigned. There are quite a few problems and endgame studies sporting this eight-nil, most of them on the loud side, but I also found a truly witty study with this theme. 1.Rg8+ Kxg8 2.Rxg2+ Kf8 Or Kh7 3.Rxh2+ Kg8 4.Rg2+ Kf8 5.Rh2 etc. 3.Rxh2 Ke8 4.Rxe2+ Kd7 After 4...Kf8 there follows 5.Rxd2 (or even Rh2 again) 5...Ke8 6.Re2+ 5.Rxd2+ Kc6 Or again 5...Ke8 6.Re2+ etc. 6.Rxc2+ Kd5 7.Rxb2 and after having cleaned the second rank of six almost-promoting pawns, White draws easily. And here is that avalanche. 26.d5 Bxa1 27.Rxa1 Qc5 28.Rd1 Re8 29.Qf4 Re2 30.c7 Rxa4 31.c8R+ Qxc8 32.Qxa4 Qc5 33.Kh2 Qxf2 34.Qg4 Re8 35.d6 Qc5 36.Qd7 Qe5+ 37.Kh1 Qe2 38.Rc1 Rf8 39.b6 f5 40.b7 Kh7 41.Qc8 Qd2 42.b8Q and Black resigned. If Kramnik can play, it's about time he defends his "classical" world title. Topalov seems a worthy opponent. The winner should play Topalov for the unified world title. Max Euwe was legendary for being unassuming, approachable and helpful. Still, the following story is amazing. I found it in today's column by Johan Hut in Gooi- en Eemlander (and four other papers) - he had found it in a posting by Gert Pijl on one of the more popular Dutch chess sites, Utrechtschaak. 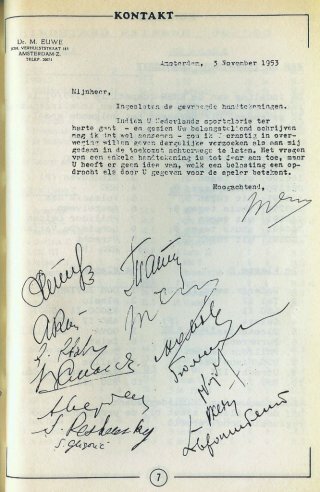 In 1953, a 10- or 11-year old boy (not Pijl himself) sent a letter to Euwe, asking him for the autographs of all the 15 participants of the behemoth (30 rounds, 2 months) Candidates Tournament in Switzerland where Euwe was going to play. It is hard to imagine a world-famous sportsman doing anything else than, at the very most, send a photo, or a card, with his own autograph, but ten days after the last round had been played (he could barely have had time to put his hat on the rack), Euwe replied with a letter, with the coveted autographs. Enclosed are the requested autographs. If Dutch sports glory is of concern to you - and judging from your interested letter I may assume so - I would like to seriously advise you to refrain from requests like the one made to me, in the future. Asking for one autograph is one thing, but you do not have any idea what a burden a command like the one given by you, constitutes for a player. In other words, Euwe had felt bound to do what the boy, totally unknown to him, had asked. He didn't like to do it, it was a burden, he let the boy know he had asked too much, but what can you do? As Hut remarks, the crux is the word command - but the Dutch word Euwe used, opdracht, does not have a clear-cut English translation. It is stronger than a request, but perhaps not as strong as an order or a command. An opdracht is given by somone higher in rank or in status; teacher to pupil, parent to child, boss to worker. And so the former World Champion went around, asking for autographs. As Hut, too, observes, there is something strange with the autographs. In the left column, we recognize (helped by the tournament book, which has pictures with autographs), from top to bottom: Petrosian - Kotov - Stahlberg - Smyslov - Averbakh - Reshevsky - Gligoric. And in the right column: Taimanov - Euwe - Szabo - Boleslavsky - Najdorf - Keres - Bronstein. Fourteen players - but there were fifteen candidates. You'd almost think the boy could have written: "Hey Mr. Euwe, you call that a reply? There were fifteen players, so fifteen autographs is what I want." One autograph is indeed missing - Geller's. It's not hard to see why. In their game in round 2, Euwe, who was in great form until his age (52) started to weigh, thrashed him in a beautiful, still famous game. Opdracht is opdracht, but apparently even for Euwe, there was one consideration more important than the wish of an autograph-collecting schoolboy - the reverence you owe a fellow-sportsman after a bad loss. 1.d4 Nf6 2.c4 e6 3.Nc3 Bb4 4.e3 c5 5.a3 Bxc3+ 6.bxc3 b6 7.Bd3 Bb7 8.f3 Nc6 9.Ne2 O-O 10.O-O Na5 11.e4 Ne8 12.Ng3 cxd4 13.cxd4 Rc8 14.f4 Nxc4 15.f5 f6 16.Rf4 b5 17.Rh4 Qb6 18.e5 Nxe5 19.fxe6 Nxd3 20.Qxd3 Qxe6 21.Qxh7+ Kf7 22.Bh6 (see diagram) Rh8 23.Qxh8 Rc2 24.Rc1 Rxg2+ 25.Kf1 Qb3 26.Ke1 Qf3 and White resigned. The 300-move barrier in tablebase endgames has been broken. Marc Bourzutschky and Yakov Konoval had already found a 290-move win in the KRRNkrr endgame (see item 298 in this Diary) and now, in the endgame KQBNkqb (opposite colored Bishops; "a draw in general," says Bourzutschky) they found a 330 move win. Generation and verification of the tablebase took their 3.6 GHz computer 3.5 weeks. As usual, the play is weird, incomprehensible and beautiful. It's interesting to see, for instance, how few moves the white Knight makes. It is stationary at d2 for 76 moves (move 59-135) and later for another 54 moves (191-245). It should be noted that White plays for the shortest mate or conversion to a winning sub-endgame; Black for the longest. 1...Ka8 2.Nb4! Qh1+ 3.Kb2! Qg1 4.Qa4+! Qa7 5.Qe8+! Qb8 6.Qe1 Bf3 7.Kb1! Qf4 8.Qe8+! Qb8 9.Qe7 Qf4 10.Qd8+ Qb8 11.Qd2 Be4+ 12.Kc1! Qg3 13.Qd4! Qf4+ 14.Kb2! Qf3 15.Qd8+ Kb7 16.Qe7+! Ka8 17.Qe8+ Ka7 18.Qe5 Kb6 19.Ka2! Qf7+ 20.Ka3 Qa7+ 21.Kb2 Bh7 22.Qf6+! Kb5 23.Nd5! Ka5 24.Qc3+ Kb5 25.Nc7+ Kb6 26.Ne6 Qa5 27.Qe3+! Kb5 28.Nd4+ Kc4 29.Nb3! Qd5 30.Qc3+ Kb5 31.Qa5+! Kc6 32.Qa8+! Kd6 33.Qf8+ Kc7 34.Qg7+ Qd7 35.Qg1 Qe7 36.Ka2! Qe2+ 37.Bb2! Qa6+ 38.Ba3! Qe2+ 39.Ka1 Qd3 40.Qc1+! Kd8 41.Nc5! Qd5 42.Na4! Qd4+ 43.Nc3! Kd7 44.Qe1! Bg8 45.Qe7+! Kc6 46.Bb2 Bc4 47.Nb1! Qd6 48.Qe4+ Qd5 49.Qe8+! Qd7 50.Qe1 Qd3 51.Qh1+ Bd5 52.Qh6+! Kd7 53.Qg7+! Kc6 54.Qf6+ Kb7 55.Qe7+ Kc6 56.Bc3 Be4 57.Qe6+ Kc5 58.Qc8+ Kb6 59.Nd2 Bf5 60.Qb8+! Kc6 61.Qa8+! Kc5 62.Qa7+ Kc6 63.Qa4+ Qb5 64.Qa8+ Kd7 65.Qf3 Qa4+ 66.Kb2 Qc2+ 67.Ka3! Be6 68.Qb7+! Ke8 69.Qa8+ Kf7 70.Qf3+ Ke8 71.Qe3 Qa2+ 72.Kb4 Qd5 73.Be5! Qc6 74.Bd4 Kd7 75.Bc5! Qd5 76.Kc3! Qa2 77.Qe4 Qa5+ 78.Bb4! Qd5 79.Qh7+ Bf7 80.Qg7 Qa2 81.Qd4+ Qd5 82.Qa7+ Kc8 83.Qa6+ Kc7 84.Ba5+ Kb8 85.Qb6+ Ka8 86.Qc7 Qb7 87.Qc5 Bd5 88.Qf8+ Qb8 89.Qf5 Qd6 90.Bb4 Qc6+ 91.Kb2 Be6 92.Qa5+ Kb7 93.Bc5 Qa6 94.Qc3 Qc6 95.Qb4+ Ka6 96.Qa3+ Kb7 97.Bg1 Kc7 98.Qe7+ Qd7 99.Qb4 Qd5 100.Kc1 Qc6+ 101.Kd1! Kd7 102.Qd4+ Qd5 103.Qa7+ Kc8 104.Qa4 Qe5 105.Bb6 Qh5+ 106.Kc1 Qe5 107.Bf2 Bd5 108.Qa6+ Kd8 109.Qa3 Kd7 110.Qd3 Qc7+ 111.Kd1 Qd6 112.Bg3 Qc6 113.Qd4 Ke6 114.Bf4 Kf7 115.Be5 Ke6 116.Bh8 Ke7 117.Qb4+ Ke8 118.Be5 Qb7 119.Qc5 Qc6 120.Qa3 Qh6 121.Bc3 Qc6 122.Qa5 Kd7 123.Kc1 Be6 124.Qe5 Qh1+ 125.Kc2 Qd5 126.Qg7+ Bf7 127.Qg3 Qd6 128.Qe3 Bd5 129.Kd1 Qe6 130.Qd4 Kc8 131.Qh8+ Qg8 132.Qf6 Qg4+ 133.Kc1 Qe6 134.Qf8+ Kb7 135.Nf1 Qe4 136.Qc5 Qc4 137.Qe7+! Qc7 138.Qb4+ Qb6 139.Qf8 Qg1 140.Qe7+ Kc6 141.Qf6+ Kd7 142.Kc2 Qg2+ 143.Nd2 Be6 144.Qh6 Qd5 145.Kd1 Qc5 146.Qg7+ Ke8 147.Kc2 Qf5+ 148.Kc1 Qc5 149.Qg6+ Kd7 150.Qd3+ Qd6 151.Qe4 Qa3+ 152.Kc2! Qa2+ 153.Kd1 Qd5 154.Qe3 Qd6 155.Qa7+ Qc7 156.Qd4+ Qd6 157.Qg7+ Qe7 158.Qg1 Kc8 159.Qg6 Qd6 160.Qg7 Qf4 161.Kc1 Qe3 162.Qf6 Kd7 163.Bb4 Kc8 164.Kc2 Kb7 165.Bc3 Bd5 166.Be5 Qc5+ 167.Kd1 Kc8 168.Qf5+ Kd8 169.Nf1 Qg1 170.Bf6+ Kc7 171.Kd2! Qg2+ 172.Ke3! Bc6 173.Nd2! Qg3+ 174.Ke2 Qh2+ 175.Kd1 Qh1+ 176.Kc2 Qd5 177.Qf4+ Kc8 178.Bd4 Qe6 179.Kd1 Bd5 180.Be5 Qb6 181.Qf5+ Qe6 182.Qg5 Qg8 183.Qf4 Qg1+ 184.Ke2 Qg2+ 185.Kd3 Qg6+ 186.Kd4 Bf7 187.Ne4 Qg1+ 188.Kd3 Qd1+ 189.Ke3 Qe1+ 190.Kf3 Qf1+ 191.Nf2! Qc4 192.Qf6 Qe6 193.Qh8+! Qe8 194.Qg7 Qd8 195.Ke2! Qe7 196.Qh8+ Qe8 197.Qh3+ Qe6 198.Qe3! Qb3 199.Qc5+! Kb7 200.Qe7+! Ka6 201.Kd2! Bg6 202.Qc5 Qb6 203.Qc4+! Qb5 204.Qc8+ Qb7 205.Qc3 Qd5+ 206.Ke3! Kb5 207.Qb2+! Kc6 208.Kf4! Qc4+ 209.Kg3! Bc2 210.Kh2 Kd7 211.Qb7+ Ke6 212.Bg3! Bf5 213.Qg7! Qc8 214.Bh4 Qb8+ 215.Kg1 Qe5 216.Qe7+ Kd5 217.Qf7+ Kc6 218.Qb3 Qd4 219.Bg3 Bd7 220.Qb1 Be6 221.Qg6 Kd7 222.Qh7+ Kc6 223.Qc7+ Kb5 224.Qb7+! Qb6 225.Qe4 Bb3 226.Bf4 Qc6 227.Qh7 Qf3 228.Qd7+! Qc6 229.Qg7 Qc5 230.Kg2 Be6 231.Qb2+ Kc6 232.Qe2 Bf5 233.Qe8+ Kb7 234.Kg3 Qc3+ 235.Kh2! Qf6 236.Qb8+ Kc6 237.Qc7+ Kd5 238.Kg1! Qg6+ 239.Bg3! Qf6 240.Qc1 Qd4 241.Qh6 Bd7 242.Qa6 Bc6 243.Qe2 Kc5 244.Be5 Qc4 245.Nd3+! Kb5 246.Qb2+! Ka4 247.Nf4 Qb3 248.Qd4+ Qb4 249.Qa1+ Qa3 250.Qe1 Qf3 251.Kh2! Bb7 252.Qd2 Kb5 253.Bf6 Ka6 254.Be7 Bc6 255.Bc5 Kb7 256.Qb2+ Kc8 257.Qf6 Kb7 258.Qe7+ Kc8 259.Qd6 Kb7 260.Bd4 Ka6 261.Qc7 Kb5 262.Qb6+ Kc4 263.Be3 Kc3 264.Qd4+ Kb3 265.Qd3+ Ka4 266.Qc4+ Ka5 267.Bc5 Qe4 268.Qc3+ Kb5 269.Bd6 Qc4 270.Qe3 Bd7 271.Qd2 Bc6 272.Kh3 Ka6 273.Be5 Bb5 274.Bd4 Qf7 275.Kg3 Qg8+ 276.Kf3 Qb3+ 277.Be3 Kb7 278.Kf2 Kc8 279.Qd6 Qa2+ 280.Kf3 Qc4 281.Qf8+ Kb7 282.Kg3 Qc7 283.Qh8 Qe7 284.Qd4 Qg5+ 285.Kf3 Qf5 286.Qb6+ Kc8 287.Bd4 Qd7 288.Kg3 Qc6 289.Qa7 Qb7 290.Qc5+ Qc6 291.Qf5+ Qd7 292.Qe5 Qe8 293.Ne6 Qg6+ 294.Kf3 Qd3+ 295.Kf4 Qd2+ 296.Kg3! Qd3+ 297.Be3 Qg6+ 298.Ng5 Qe8 299.Qd4 Qd7 300.Qb4 Qd5 301.Bf4 Bc6 302.Qf8+ Kd7 303.Qg7+ Ke8 304.Qc7 Qg2+ 305.Kh4 Qh1+ 306.Bh2 Qd5 307.Kh5 Bd7 308.Bd6 Qh1+ 309.Kg6 Qc6 310. Qb8+! Bc8 311.Qb4! Qd5 312.Qb6 Qf5+ 313.Kh5! Qg4+ 314.Kh6 Qh4+ 315.Kg6! Qc4 316.Kf6 Qf1+ 317.Kg7! Qf5 318.Qe3+! Kd7 319.Nf7 Kc6 320.Qc1+ Kb5 321.Ne5 Be6 322.Qc6+ Ka5 323.Qa8+ Kb6 324.Qb8+ Ka6 325.Bc7 Qg5+ 326.Ng6! Qe3 327.Qa8+ Kb5 328.Qe8+ Ka6 329.Kf6 Qc3+ 330.Be5! (see diagram) and White wins. PS: Bourzutschky & Konoval also found a 317-move win in KQBNkqn, but that one is still in the process of being verified. Thanks to René Olthof for showing me this. Thanks to Zvi Mendlowitz for showing me a record that should have been on my site before. In Check! I gave the history and the present record (37 half-moves, by Ponzetto) of the Consecutive Checks Task, but I did not give the record where promoted pieces are allowed in the initial position. 1.Rf5+ Rf4+ 2.Ne4+ Nxe4+ 3.Rf6+ Nexf6+ 4.Qxf4+ e5+ 5.Rxe5+ c5+ 6.bxc6+ Qc5+ 7.Bxc5+ bxc5+ 8.Rexc5+ Ke6+ 9.Bd7+ Nxd7+ 10.Qf6+ Bxf6+ 11.Re5+ Bxe5+ 12.Rxe5+ Ndxe5+ 13.Qd7+ Rxd7+ 14.cxd7+ Qb6+ 15.Qaxb6+ Nc6+ 16.Qxc6+ Qd6+ 17.Qd5+ Qxd5+ 18.Nxd5+ Ne2+ 19.Qxe2+ Ne3+ 20.Qg4+ Qxg4+ 21.Nf4+ Qxf4+ 22.Qe4+ Qe5+ 23.Qxe5+ with 45 consecutive checks. The record for consecutive discovered checks, without promoted pieces in the initial position, is 11 half-moves, by O. Stocchi (1931) Here too, I omitted the record with promoted pieces. 1.g8B+ Kd5+ 2.Rbe7+ Nb7+ 3.b6+ Bb5+ 4.Rxc3+ Rxa2+ 5.Rf2+ g2+ 6.Ng3+ Nxh5+ 7.R7f4+ - 13 consecutive discovered checks. PS 14 February 2009: Alexey Khanyan shows that "Lapierre could have saved a whole piece", as his email is titled. 1.g8B+ Kd5+ 2.Rxe6+ Nb7+ 3.b6+ Bb5+ 4.Rxc3+ Rxa2+ 5.Rf2+ g2+ 6.Ng3+ Nxh5+ 7.Rxh6+ - indeed more or less the same checks, but with 25 pieces on the board vs. Lapierre's 26. As Khanyan writes: "Rook b7 defends the White men against a check by the Queen and Rook f7 against a check by Bishop h6. In my revised version those functions are performed by just one Rook." For the sake of completeness (they are already elsewhere on this site) - here are the records by Ponzetto and Stocchi. 1.Nh2+ f1N+ 2.Rxf1+ gxf1N+ 3.Ngxf1+ Bg5+ 4.Qxg5+ Bg2+ 5.Nf3+ exf3+ 6.Kd3+ Nc5+ 7.Qxc5+ Re3+ 8.Nxe3+ c1N+ 9.Qxc1+ d1Q+ 10.Qxd1+ e1N+ 11.Qxe1+ Bf1+ 12.Nxf1+ f2+ 13.Ne3+ f1Q+ 14.Qxf1+ Qxf1+ 15.Nxf1+ Re3+ 16.Nxe3+ b1Q+ 17.Rxb1+ axb1Q+ 18.Nc2+ Nf2+ 19.Bxf2+ - with 37 checks. 1.g8B+ Kc4+ 2.Nd3+ Bc6+ 3.Be2+ Nd4+ 4.Nxa2+ Nec2+ 5.Nf4+ Nxe2+ 6.exd7+ with 11 consecutive discovered checks. Most users would be led to believe that this unsigned description must be mine, but it isn't. In fact, it's a text I object to. Apart from the moronic wording, almost everything in it is wrong. I discovered it recently, but it must have been there for a long time. Where did it come from? Who on earth had taken it upon himself to dictate Google users what my site is about? Why wasn't the meta-tag with my own description working? And most of all: how could I get rid of it? As it turns out, I can't. My spiritual property has been hijacked by an organisation named DMOZ. Because this description (the Net is infected with millions of them) was anonymous, it cost me considerable effort to discover that DMOZ is the culprit. DMOZ, "the Open Directory Project; the largest, most comprehensive human-edited directory of the Web," as they proudly describe themselves, are building a database of websites, adding their own descriptions. It's a bit obnoxious that they don't use your description, but OK: DMOZ should be free, within certain limits, to idiotically tag sites as they see fit - for their own users. The bad thing is that they have given Google access to their database, and that Google uses their descriptions, often overruling the original description of the site's creator. This is a violation of my right to speak with my own voice. The even worse thing is that DMOZ refuses to change their description, as I found out when I tried to change their really offensive description of the Dutch part of my website. These censors don't have an email-address for complaints; you have to navigate their website and fill out a form, after which they tell you it may take a week or even months before they have time to look at your request. In a forum on the Dutch DMOZ, my postings were answered by faceless, email-less handles, apparently higher-ups in that sect, who told me to study a page where I could learn how to write a description. My chances to have a go at describing my own site were slim, they said - their description was "100 % correct". Nowhere on the Dutch DMOZ site (nor on the main one) are there any email-addresses, telephone numbers, names of editors, or of a responsible editor-in-chief. It's an anonymous, impenetrable, dark world. It presents a danger. Here is a body that can make any site look like anything they want, seemingly in the Webmaster's own words. And they're answerable only to themselves. They are enemies of free speech. Google should stop using their database. If there is a way to un-hijack my site from DMOZ, by getting it unlisted or in any other way, please let me know. DMOZ is spoiling the pleasure of building a website. White, 13-year old Donna Schut who is Dutch girls under-14 champion, could have drawn with 44.Qg5+ etc. But she saw a win: 44.Re2 and Black saw it too, because he resigned. 'Can't do anything against the mate,' he said. A grandmaster who was looking on, later said he had thought that, too. Only when Donna's father fed the game into his computer, did he notice that Black had resigned in a winning position: 44...Qe4+ 45.Rg2+ Qxg2+ 46.Kxg2 f3+ etc. PS 22 February: Dolf Wissmann points out that when he was on the lucky end of an ultimate blunder, it was almost the same blunder. See item 186. See PS to item 293. A diagram that will haunt him for the rest of his life. Qf7 and Kb6 are easy, well deserved wins. 43.Qf8+?? The horror, the horror. Setting up Black's mating net for him. 43...Kb7 44.Qf7+ Did he miss 44.Qxf4 Ra2+ 45.Kb4 Nd5+ this time? 44...Bc7+ 45.Qxc7+ Kxc7 46.h5 I wonder if Bareev saw the mate in 3 with 46...Kc6. If he did, it was a nice gesture not to play that - a fancy move in a tragic situation would add insult to injury. After 46...Rg2, White resigned. It's unbelievable that minutes later, Carlsen managed to play a good second rapid game. It was a draw and he was out - but what fighting spirit. He will go far. For forty-eight years, there was a game I felt vaguely ashamed of. When I finally played it over (as to why, see Omgekeerd Valsspelen, but that's in Dutch), it turned out to be far worse than I remembered. Early 1958, when I was 14, I played for my school against a boy named Teuling. We reached an ending where I had three pawns for a Bishop, and which was a dead draw. But as my team needed a win, I made an all-out attempt to achieve that win - which went completely wrong. The easiest win is 54.h3 or h4, but Teuling chose 54.e6 and after 54...Kxe6 55.Kxg4 I did the despicable thing that kept nagging at me for almost half a century - I begged for mercy. Of course I had seen there was no win, I said; I had had to try for my school, that had backfired, and would he please give me that draw, which I had seen was inevitable, after all. After some initial misgivings, Teuling was generous; draw. When I fed this game into my database, I had my electronic analysis partner kibitzing, to see how badly we had played. That was horrible, indeed. When I was finished, I forgot to switch it off, and when I looked at the screen sometime later, which still showed the final position after 55.Kxg4, I saw it indicated an advantage of close to ten pawns. My hair stood on end when I noticed it was Black who had that advantage. After 55...Kd5, one of his pawns promotes. I had been begging for a draw in a winning position. From the 12th round of the World Junior Championship, played yesterday. 41.Qxd5 and Black, facing a unusual back-rank mate, resigned. 32...Rxd8 Or 32...Qxf4+ 33.Kh7 Rxd8 34.Rxd8+ Kxd8 35.Qf6+ Qxf6 36.exf6 and White is winning 33.Rxd8+ Kxd8 34.Qf8+ Kc7 35.Qd6+ Kb6 36.Qxd4+ Kc7 37.Rh5 Nc3 38.Rg5 Qh4+ 39.Rh5 Qg3 40.f5 exf5 41.Rxf5 Nd5 42.Rf7+ Kb8 43.Kg7 and Black resigned. Thanks to Martin van Essen and Johan Hut for showing me these games. My apologies to readers who encountered popup ads when visiting my pages lately. They were caused by webstats4U, the company that took over NedStat, of the friendly and convenient counters I had on my pages for years. I removed these counters, and switched to StatCounter.